London was next to host a qualifier, where the best competitors from all over the United Kingdom came together to battle for Britain’s spot on the show. Season one was a mega hit in the UK, aired prime time. The qualifier event was also aired on Sky Sport. The event was sold out with people queuing for tickets. H.E. the Ambassador of Malaysia to the UK was on hand to present the belt and Key to Malaysia to Jordan Watson. The event received rave reviews from the local press and Sky Sport broadcast the show on 2 replays by popular demand. 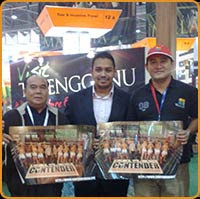 To Bernard's left is Riaz Mehta, Producer of Contender Asia II, and on the far left of this picture is Stephan Fox, Vice President of WMC. 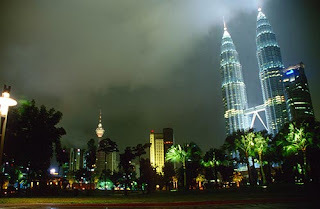 country that can only be described as truly Asia, Malaysia. Now time to prepare. Pls arrange for fights with some good opponents. And stop fighting the Kompayaks and Tempoyaks. You'd learn more from losing to a good fighter, than KOing Kompayak in round 1. Good opponent yes but not someone who can damage u and totally kill your contender dream ... Anyways good job guys..
Bernard ko masih ajar taekwondo lagi ker . Ke dah lupa asal usul. Harap tak lupa pada taekownodo yang dah banyak ajar kita tentang dunia beladiri ni. Politik kita lagi dasyhat dari muaythai. Apaapa pun kalau turun trengganu jangan lupa singgah. Kirim salam pada boss ko. Wow, Bernard is going to be famous all over the world. Train hard, yeah. Don't get KOed in 1st round, then you'll be remembered for the wrong reason. to all 8 fighters selected, reach for the skys guys. 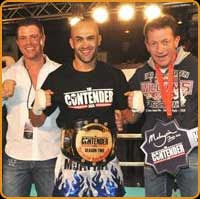 To participate in Contender Asia, is the ultimate in muay thai. Go for it. May the best man win! The referee who judged Faizal-Abbas fight should stay away. I think a lot of people are confused about muaythai point system etc. We are organising a seminar on this in May. Why don't you join us. I am getting more info/verification on your comment. You really sound like a true Contender Asia fan. It's gonna be a Tengku-Faizal final. That's the main dish. The rest are appetizers...they are there just to make up the number 8. Everyone is entitled to his own opinion. This is my own opinion. Tiap-tiap exco kerajaan negeri, ada minimum 1 india. Sini saya tengok ah...langsung tadak india....satupun. You semua ingat india tak bagus ka..tomoi. I am a die-hard muay thai fan. Just to tell u, I love this blog. Articles are well written, and well presented. This is the 1st website I read every morning, for the past 2 weeks. For a novice blogger, you are doing a great job. The boxxtomoi blogspot is good as well...but I still prefer this tigers blog. the 'bernard radin' blog is a disaster. There's nothing new for past months. Time to give VSS and terminate the moderator for that blog. 19 athletes representing 18 countries and 5 continents will embark on the quest of the lives to compete for their country, their families, and themselves to become the champion of all champions and the next Contender Asia champion. Question :- Why 19? Isn't it supposed to be 16? are they really the best muay thai fighters IN THE WORLD? Yodsanklai is not there. Buakaw is not there. remy bonjasky is not there. badr hari is not there. Thank you for the compliment, fyi this blog is a team effort,the muaythai tigers are a team, we work together, the info here is contributed from various members of our team. Then put together in this blog. 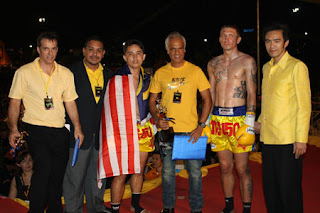 Our main target is to help build Muaythai in Malaysia and to prioritize the athlete. (BEAR HEART)..Hunt and bring back Contender belt to MTA Tambun. From JOI,LAN & AWA..MTA Khru. Tengku - faizal final??? What if they undi and both of them are in the same grou? Bro, trust me, there will be no undi. U will easy passage for some boxers. There will be group A & B and the drawing of lots will be done by the respective fighters managers at the Ministry of Youth and Sports. I thought there was an earlier posting from you that Khem Fairtex was the winner of the Super 8 CA2 qualifier at the King's Cup in Bangkok. there will be some changes to the fighter listing if the winner at each country doesnt have good personality/character and doesnt speek english. Tengku kena ambik kursus English! meaning, if you won, but u cannot speak english then you are out? No such word as 'speek'. Oops...Your place is also now in jeopardy. If Tengku wins Super 8, will he be kicked out because he doesn't have good command of english, and the runner-up takes over his place. Tengku...sudah jatuh ditimpa tangga! Kesihan! Maybe we should have an English TOEFL test for the 8 qualifiers. If just Khoo passes, then we send Khoo to CA2. No need for Super 8 fights. Congratulations 'South Africa Qualifier' and thanks for the comment. We seem to have an English teacher in our midst.I now blog with the Oxford dictionary next to me :)Don't mind him, he's always picking fault with me too. Anyway I'm sure the producers won't be giving all the fighters a written test but CA2 is a reality show and therefore I think the ability to communicate would definitely be a bonus for any fighter. Don't you agree? Khem Fairtex was chosen to represent Bangkok area, or the central Thailand, and recently they had the Southern selections, I'm assuming these fighters will meet to determine who represents Thailand. I've been sponsored by my government for english class. My friend from Russia levin artem is going for classes too. Wish us luck. They will be a big event in Jamaica. Big fighter names buokaw, yod, wayne parr all will befighting. Your malaysia team arly and fuzal is in list too. Good luck malasie. South Africa Qualifier. patut buang perkataan asia... contender asia tapi ada kanada, sepanyol,rusia? ni semua negara asia ke?separuhnya dari luar asia.. dalam sukan asia pon takde sepanyol,rusia ni.. I'm glad you and Artem are going for English classes,what a positive attitude you two have. Rancangan ini dipanggil 'Contender Asia' kerana rancangan 'Contender' memang sudah wujud iaitu rancangan realiti boxing. 'Asia' dalam 'Contender Asia' maksudnya seni Asia iaitu Muaythai yang dipertandingkan. 'Fighter' CA2 memang dipilih dari seluruh pelusuk dunia. 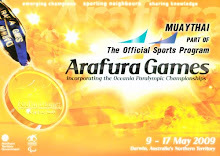 Malaysia will be sending a Muaythai Team to participate in the Arafura Games in Darwin, Northern Australia. We have a very busy year ahead!